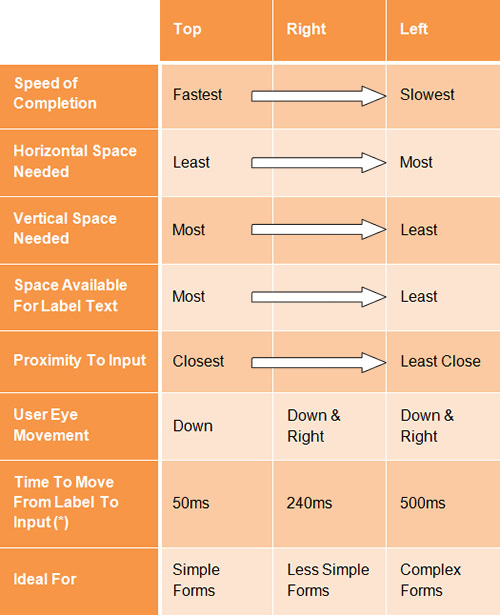 Also you can see this image from Smashing Magazine that shows the advantages and disadvantages of the positions of labels. I do agree with the pros & cons of Top-aligned labes, however, the last conclusion that Top-aligned labels are only ideal for Simple forms sounds strange to me. Should not the type of labeling be consistent across the whole application, i.e. for the whole Internet Banking application that has both simple and complex forms? Not the answer you're looking for? Browse other questions tagged forms input labels or ask your own question. Should label and field be separated with colon? On a field label which should come first, the name of the field or the qualifier?